Ultra Bright LED Lamp & Super Long Endurance - Powerful LED generates a brilliant large area floodlight or a perfectly focused spotlight, the led flashlight can easily light up an entire 100 square meters room or focus in on objects up to 1000 feet away, Last for more than 5 hours with 3 regular AAA batteries or a single rechargeable 18650 battery. (Batteries not included) Compact & Ergonomic Design - Water resistant, Skid-Proof and Anti-fall design. 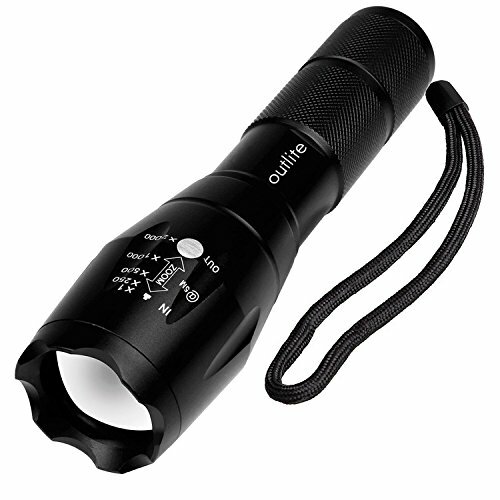 Built for rough handling.Outlite flash light can be waterproof from splashing water from any angle. 2 spares O rings for you replace the flashlight to make it waterproof. Made of durable aluminum alloy crust, can survive a 10-foot drop. Head cooling groove design make you hands feel comfortable for long time use. Tail copper battery contact design effectively prevents poor battery contact. Adjustable Focus & Five Modes - Settings with 5 modes: High, Medium, Low, Strobe and SOS emergency modes. Wide-to-narrow beam zoom makes it ideal for use around the house, dog walking, or camping. Best flashlights for running. With mini size and comfortable hand rope design, the flashlight is compact enough to fit in your pocket, backpack, or purse allowing for easy storage and quick access. Exceptional Value - This high lumens flashlight has the lowest price, keep the led flashlight in your room or in your car for daily use, a great gift to a friend or family member. Same "military" tactical flashlight AS SEEN ON TV, shopping networks, and commercials but at a very competitive price! Every genuine Outlite comes with a 2-year no questions asked replacement warranty and friendly customer service provided by Outlite.You have the right for hassle free replacement or money back during the warranty. We take care of all quality-related issues with a replacement or refund. If you have any problem with the product, please contact us.